BREAKING NEWS: Foster Care "Faith in Action" victory in Sacramento! Just moments ago, Governor Schwarzenegger signed AB 12! With this legislation, 1 in 5 youth who “age out” nationally will receive the support of the foster care system to age 21, ending an era of neglect and providing youth in foster care with the same common-sense assistance provided to children from in-tact families. Thousands of relative care providers will participate in the new, federally-funded subsidized guardianship program, providing much needed support that promotes stability among children. Thank you to everyone who has made this historic moment possible. You made calls, visited Sacramento, wrote letters and together, you sent the message that California can and must do better for its children and youth in foster care. Thank you again and stay tuned! Much work ahead -- but for the moment, let's be grateful for this step forward for our children -- and take a minute to email the governor and thank him for his support by clicking here! What lured two bright, energetic, capable young women from productive and interesting jobs to come to work on the staff of All Saints Church? 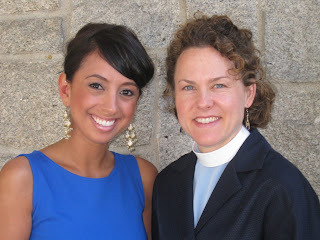 Juliana Serrano, Director of the Office for Creative Connections [pictured left] arrived on June 1 from her position as Director of Operations and co-founder of ENCOMPASS based in Monrovia, CA, a non-profit youth development organization dedicated to sparking compassion, personal responsibility and an appreciation of differences among California teenagers. Carissa Baldwin, Director of Peace & Justice [pictured right] came on board September 1 from her position as Assistant Rector and Outreach Center Director at St. Stephen’s Church in Houston, Texas. Come meet these dynamic young leaders and be inspired by the journeys that brought them to All Saints Church and the vision they have for the work and witness ahead of them as members of the All Saints team! The BEST EVER Celebration of Ministries Sunday! All Saints welcomes a new arrival! With thanks to all who’ve worked so hard to make this long-dreamed of new web presence a reality and especially to our brilliant partners at Arroyo Design! Our website is yet-another-way for us to proclaim the Good News of God’s inclusive love to world in desperate need of it as we work to turn the human race into the human family — one ―link at a time! The Blessing of the Beasts! 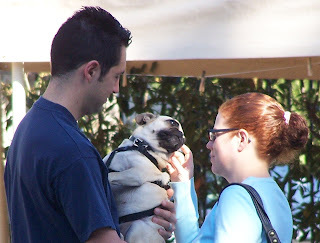 On Sunday, October 3rd All Saints will take its mantra --"Whoever you are and wherever you are in your journey there is a place for you here" -- to a new level with our annual St. Francis Day Blessing of the Animals service. All pets and their owners are invited to JOIN THE PROCESSION and then adjourn to the outdoor worship service on the quad lawn. This concludes with a blessing of animals with the staff of Children, Youth and Families. 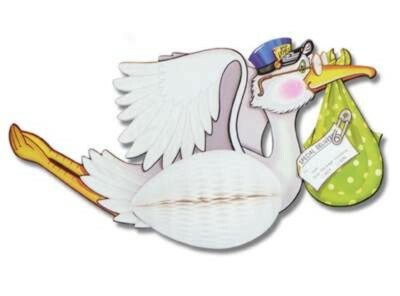 Any interested persons with animals are asked to please arrive no later than 8:45 a.m. to participate in the procession. This coming Sunday, September 19th, is a "Feast Day" at All Saints Church: The Feast of Homecoming Sunday! As we give thanks for all the abundance we've been given in the food we'll share and in the community we'll celebrate, we also take on the challenge of putting our faith into action on behalf of the children who go to bed hungry each night. I write to you on behalf of the nearly 17 million children who struggle with hunger in our country. For millions of children, the meals that they receive at school or in child care are their only nutritious meal all day. I ask that you vote for the Improving Nutrition for America’s Children Act. (HR 5504). I especially support the provisions in this legislation that would increase the number of eligible children, increase outreach to underserved children, expand before and after school programs, and make access to these programs easier for families. I also support the provisions in this legislation that provide for enhanced funding for nutrition education, and that help communities establish local farm-to-school networks. As a person of faith, I believe that we are called to care for one another, especially the most vulnerable among us. Please ensure that strong and robustly funded child nutrition legislation is passed in the House of Representatives. Add your own comments to this letter, and mail to your Representative. Since security screening in Washington, DC delays mail for a week to, we suggest mailing this to your Representative’s local office. You can locate your Representative on the website of the California Council of Churches. 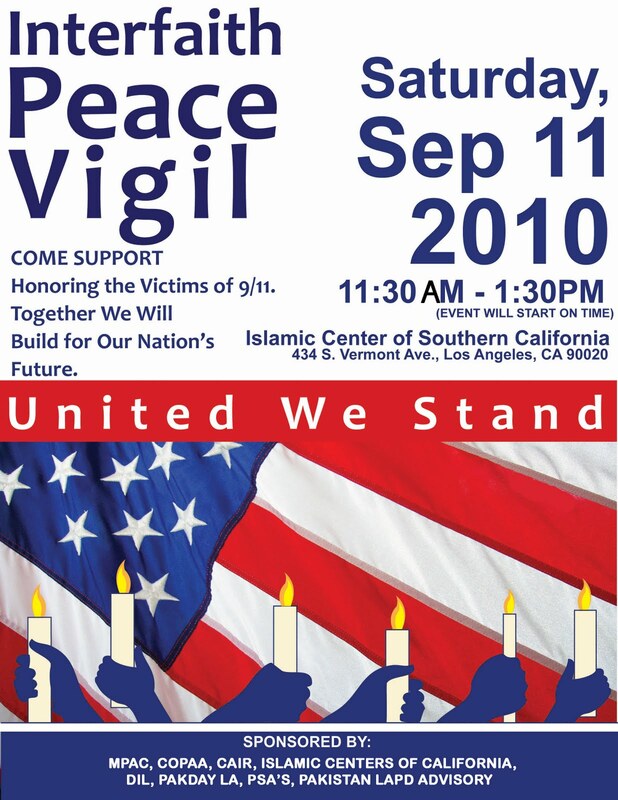 The 9th Anniversary of 9/11 was observed today at the Islamic Center of Southern California with an Interfaith Peace Vigil. All Saints' rector Ed Bacon was one of the featured speakers and a number of members of the All Saints community were in attendance. Here are photos from the event along with the text of the rector's remarks. 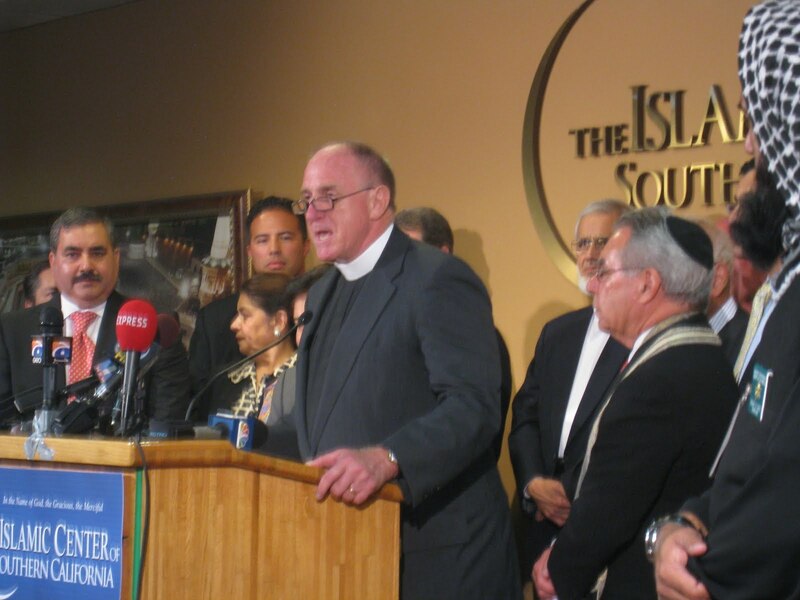 All Saints' rector Ed Bacon will be one of the featured speakers at this Saturday's Interfaith Peace Vigil at the Islamic Center of Southern California. Located at 434 South Vermont Avenue in Los Angeles, the event will begin at 11:30 a.m. and conclude by 1:30 p.m.